A citizens advocacy group is urging residents involved in a flap with their homeowners association to learn their rights. Local 6 is spending the entire day focusing on HOAs, and Jan Bergemann, of Cyber Citizens For Justice, said homeowners need to first learn the rules and laws in dealing with HOAs. Numerous homeowners have contacted Local 6 recently, seeking help after receiving intimidating letters from their HOA. Phylis Bisking and Susan Dearolf, who live in the Canoe Creek Woods subdivision in St. Cloud, said they can't pay their HOA dues right now. "We have reasons, just like everyone in this world today is having a hard time," said Bisking, who started receiving notices from her HOA months ago. Dearolf, who has also received notices from her HOA. Both women have been sent lawsuits to foreclose if they do not pay back dues. "I mean, come on, they're robbing us," Bisking said. Dearolf said she feels like she signed a pact with the devil. "What am I supposed to say? 'I give up, just take the house?' " Dearolf said. Bisking was already struggling with her mortgage when her son was hit by a car while riding his bike, causing more medical bills she could not afford. "And then I got this stupid homeowners association that I have to deal with, which they don't offer anything to us," Bisking said. Their subdivision is caught up in a so-called "turf war." 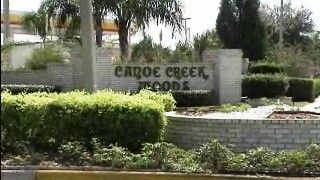 Only half the residents at Canoe Creek Woods pay HOA dues, and there is nothing the HOA can do about it. All the residents in the 500-home community use the same entrance, which the HOA pays to maintain, along with the land around seven retention ponds in the subdivision. Only 258 homes on the north side of Creek Wood Drive are responsible for the annual dues in the neighborhood. Canoe Creek Woods HOA president Anthony Davola said in the early '90s the homes to the south argued they had no common ground to maintain and won. The HOA was dissolved, but the bills did not stop. "Right now, we're sitting on a high rate of foreclosure on our side, and there's a high rate of foreclosure on that side," Davola said. Devola said he was reluctant to send out the lawsuits to Bisking and Dearolf, but if the HOA does not take action, it could collapse. "Over the years we've had meetings where homeowners that felt that they didn't want to pay because that side didn't pay, but they can't break away from it. It's like a tombstone. Once it's there, it won't go away, and you have to pay," Devola said. go into receivership, but an attorney said the fees could jump to as much as three times the current fees, so it is a risky move. According to Cyber Citizens For Justice, homeowners should do the following to "fight for their rights:"
Learn the rules and laws. Don’t ignore letters received from the association. Respond immediately by certified letter. Do not send emotional e-mails and/or telephone calls. Don’t rely on verbal agreements or promises, and always create a paper trail. Most letters received from board, management and/or attorney are aimed at intimidating the homeowner. Respond accordingly and do research before falling into traps. The Internet provides many sources. Respond immediately to the so-called 45-day lien/foreclosure notice letter (FS 720.3085). When receiving letters, don’t think, “It’s just the HOA.” The HOA can take your home but only if the debt is for unpaid dues and assessments -- not for fines. Don’t ignore so-called presuit mediation offers (FS 720.311). You lose your right to recover legal fees even if you win the lawsuit. If your association takes you to court without offering presuit mediation, ask the judge to dismiss the case. The association ignored the statutes requiring mandatory presuit mediation. Watch Local 6 News for more information about HOAs.